The consensus among the world's scientists that human behavior is contributing to the life-threatening degradation of natural systems continues to be ignored by the chief supporters of the common core curriculum. These supporters - corporations, politicians, and educators who promote the further expansion of the industrial/consumer and now digitally dependent lifestyle - have now encoded their misconceptions and silences in the Common Core Curriculum. The education that will prepare students in the decades ahead is simply not part of the thinking of the groups promoting the reforms. 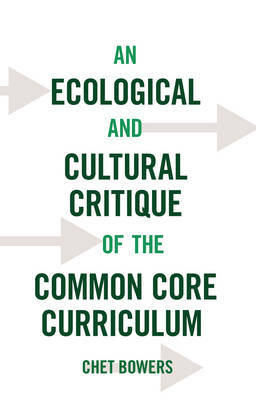 An Ecological and Cultural Critique of the Common Core Curriculum suggests a number of concepts teachers can introduce that will enable students to examine cultural assumptions that originated in the abstract thinking of philosophers and that continue to underlie current ecologically unsustainable patterns of thinking. These concepts will also enable students to recognize the traditions they need to renew before the digital revolution reduces life processes to data that can be monetized.